Can Acetyl L-Carnitine Be Taken With Levothyroxine? It is important to know whether or not certain dietary supplements will interact with your medications. Synthroid is a thyroid medication used to treat hypothyroidism, also known as underactive thyroid. Kelp supplements are commonly used to support healthy thyroid function. Kelp supplements may increase your thyroid hormones, which can affect the dose of Synthroid needed. You should consult your doctor before taking kelp supplements if you are currently taking Synthroid. Your thyroid weighs about an ounce and is situated at the front of your throat. This butterfly-shaped gland controls your metabolism. Your thyroid uses the mineral iodine together with the amino acid tyrosine to produce two primary thyroid hormones known as triiodothyronine and thyroxine. Your thyroid typically produces 80 percent thyroxine and 20 percent triiodothyronine, however triiodothyronine is four times as potent as thyroxine. In addition, thyroxine can readily convert to triiodothyronine when needed. Hypothyroidism can cause weight gain, fatigue, hair loss and goiter, which is an enlargement of the thyroid gland. Synthroid is a synthetic form of thyroxine prescribed to replace the thyroxine that your thyroid is unable to produce. Synthroid is usually used as a life-long thyroid hormone replacement treatment. An autoimmune condition known as Hashimoto's thyroiditis, is the most common cause of hypothyroidism. In Hashimoto's your immune system produces antibodies that attack your thyroid, which prevents your thyroid from functioning optimally. Iodine is a necessary mineral found in the ocean's sea life, particularly seaweed. Most of the iodine in your body is found in your thyroid gland. Foods rich in iodine are fish that eat sea life, such as cod, haddock, perch and sea bass. Kelp is a type of seaweed very common in Asian diets. 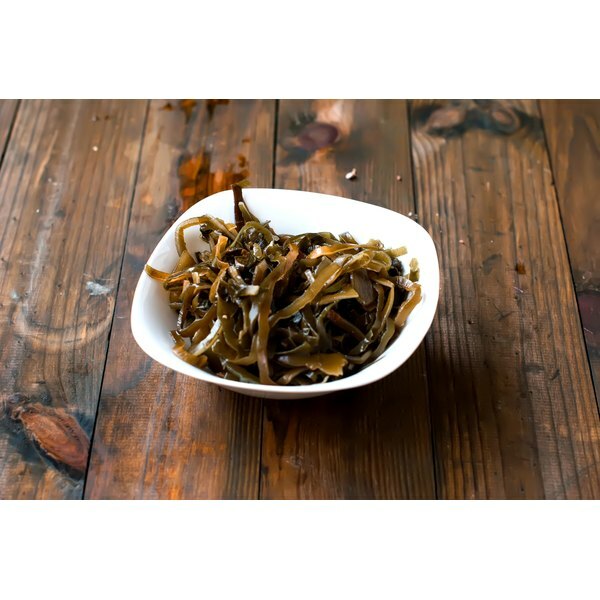 Because of its rich iodine content, kelp is sold as a dietary supplement marketed for thyroid health. Iodine deficiency is a common problem throughout the world, according to MedlinePlus. However, iodine deficiency is not a common cause of underactive thyroid. You should use caution when combining kelp supplements with Synthroid. While on Synthroid, your doctor takes monthly measurements of your thyroid hormones to ensure that you do not have too much or too little. Taking kelp supplements may increase your thyroid hormones, which means your Synthroid dosage will need lowering. Most health care providers prefer to stick with an optimal dosage for best results and since kelp supplements may interfere with this, it may be best to avoid them.